Make yourself at home in one of the 84 air-conditioned rooms featuring LCD televisions. Complimentary wireless Internet access keeps you connected, and satellite programming is available for your entertainment. Private bathrooms with showers feature complimentary toiletries and hair dryers. Conveniences include phones, as well as safes and desks. Welcome to Hilton Lake Como, an elegant hotel near the western lakefront. The first Hilton hotel in the Lake Como region, we offer personalized service, a unique vantage of the lake from our sky bar and rooftop pool, and conveniences like a wellness spa, restaurant, fitness center and stylish event space. Walk to Villa Olmo in three minutes, and reach city center and popular shops in 15 minutes. Public transport is frequent, and located just outside our main entrance.Stay in style in a duplex suite with glass roof overlooking the lake, or a superior suite with private terrace and whirlpool. All guest rooms have parquet floors, wood and glass furnishings, and large windows that invite the light in, plus comforts like a Hilton Serenity bed, LCD TV and WiFi access.Spend an afternoon by our rooftop infinity pool, and unwind in the rooftop solarium. Pamper yourself in the eforea spa with indulgent treatments, a swim and hydro-massage in the indoor pool, or a workout in the 24-hour fitness center. Featured amenities include complimentary wired Internet access, a computer station, and complimentary newspapers in the lobby. Event facilities at this hotel consist of conference space and a meeting room. A shuttle from the airport to the hotel is provided for a surcharge (available 24 hours), and limited parking is available onsite. Make yourself at home in one of the guestrooms featuring minibars and flat-screen televisions. Complimentary wireless Internet access keeps you connected, and satellite programming is available for your entertainment. Private bathrooms have deep soaking bathtubs and rainfall showerheads. Enjoy Mediterranean cuisine at Bistro, a restaurant which features a bar, or stay in and take advantage of the room service (during limited hours). A complimentary continental breakfast is served daily from 7 AM to 10 AM. With a stay at Gira Guest House in Como, you'll be within a 10-minute drive of Como-Brunate Funicular and Casa del Fascio. This guesthouse is 12 mi (19.3 km) from Lake Lugano and 9.9 mi (15.9 km) from FoxTown Factory Stores. Make yourself comfortable in this individually furnished apartment, featuring a kitchenette with a full-sized refrigerator/freezer and a stovetop. Your memory foam bed comes with a down comforter and Frette Italian sheets. A 27-inch flat-screen television with satellite programming provides entertainment, while complimentary wireless Internet access keeps you connected. Conveniences include a desk and a microwave, and housekeeping is provided daily. 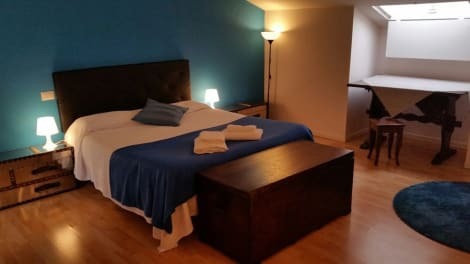 Offering free Wi-Fi, Il Loggiato Dei Serviti is located in central Como, just 350 metres from Como Train Station. The shores of Lake Como are a 5-minute walk away. 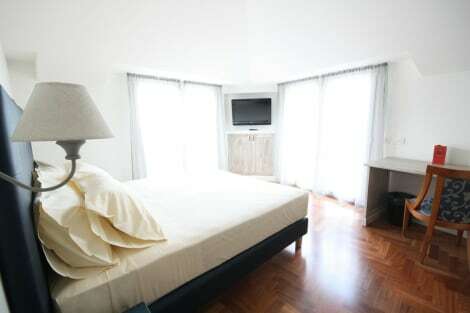 Decorated with elegant wood floors, each room is air conditioned and features a private bathroom. Breakfast buffet includes sweet products and is served in the breakfast room. Staff are available at reception 24 hours a day. Como Cathedral is a 10-minute walk away from Il Loggiato. In 15 minutes by car you can reach the Swiss border. Parking is available in the neighbourhood, both free and at an additional cost. Mini Hotel Baradello is 4 km from Como city centre and a 5-minute drive from the A9 Milano-Chiasso motorway. It offers air-conditioned rooms and free parking. Rooms are decorated in a classic style. They include a TV with both satellite and pay-per-view channels. The private bathroom comes with a hairdryer and toiletries. A buffet breakfast is served every morning in the dining room. The reception at the Baradello Hotel is open 24 hours a day. A bus stopping in front of the property reaches Lake Como, 4.5 km away. Como Nord Camerlata Train Station is a 10-minute walk away and provides direct connection to Milan. Situated in the historic Lombardy region of Italy, Como boasts the beautiful Lake Como with the transcendent Alps as its dramatic backdrop. This popular city and its surroundings feature an abundance of natural beauty and stunning architecture to admire. Lakeside walks provide an array of picturesque views on which you'll appreciate the countryside and ancient architecture, including sumptuous villas dating back to Roman times. You'll find a number of outstanding churches including the Romanesque Basilica di San Fedele, which resembles a clover leaf due to its three apses and three naves. Visit on a Saturday and you'll be able to browse the market that takes over the facing piazza. Here you can examine antiques and buy locally produced arts and crafts. Arguably the city's most important sight, and certainly its most dramatic, Como Cathedral's construction straddled five centuries, beginning in 1396 and ending in 1740. Several influences are reflected in the look of this imposing edifice, principally Gothic and Renaissance. Como is the birthplace of celebrated writers Pliny the elder and his nephew Pliny the Younger who, between them, took a range of posts including lawyer, philosopher, provincial governor, military commander, politician and judge. The mantle of author can be added to this impressive tally of roles, and Pliny the Younger's The Epistulae is noteworthy for its descriptions of the eruption of Mount Vesuvius in 79AD. The 19th-century writer and poet Alessandro Manzoni, born in nearby Milan, is perhaps best known for his exciting novel I Promessi Sposi (The Betrothed). You can visit the places he describes so vividly, including Acquate, which is home to the book's love-struck protagonists, Renzo and Lucia. Nestled in the hills of Lake Como is the sophisticatedly bohemian Il Gatto Nero. Decorated with quirky art, this warm, wood-panelled restaurant provides a romantic setting, particularly in the evenings when SEOSITE_LEVEL_DESCRIPTIONs are illuminated by candlelight. This beguiling eatery possesses a terrace from which you'll enjoy enchanting views of the lake below. Close to Piazzetta de Orchi you'll find La Vita è Bella, a cosy restaurant where the service is warm and the salads are a speciality. The majority of bars can be found within the Como hotels and restaurants and so aren't necessarily apparent at first sight, but are well worth seeking out. One such place is the Grand Hotel Tremezzo which, to this day, maintains the impeccable décor and service traditions of its early 20th-century beginnings, when it welcomed the rich and famous through its doors. There are a number of standalone bars and clubs, from Bar Gabbiano Menaggio, with its celebrated ice cream, to Bar Tana Menaggio, a magnet for the bright young things of Como where DJs spin the latest club sounds. If your credit card can bear it, there's a cornucopia of small shops and boutiques including the classic chic of Max Mara and the high-end couture of Tessabit.